Mati City hosts an array of accommodations to suit your basic needs during your stay. I must admit, it was quite a challenge to contact the numbers of most resorts and inns here, perhaps because of the fluctuating mobile signal and intermittent internet access. But I hope this list will help you find the right accommodation for you on your visit to mesmerizing Mati. Nestled on a far, secluded end of the Dahican Beach, Pacific Breeze offers homey, clean, and tastefully designed rooms and a family villa. The resort started out as a family beach house owned by Ms. Jing Rabat (wife of the mayor's brother), until they finally opened it to the public. Since it is on one end of the Dahican Beach, the place is quiet and away from the surfers' crowd. Here, you will be enticed to wake up early to witness the sunrise; or just lay down on a hammock in indulge in the soothing sound of the waves. The rooms are air-conditioned and has a spacious veranda and toilet and bath. There are two beds that can actually fit two to four persons. Each room also features an artwork made by the owner herself, Ms. Jing Rabat. The family villa, on the other hand can fit 10-15 people. 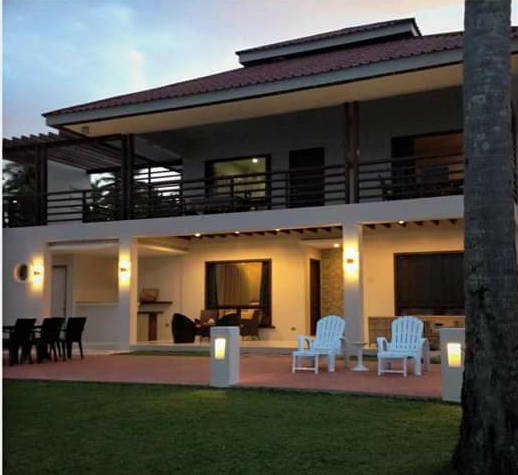 This two-level villa is complete with a living room, dining and kitchen, and has two bedrooms and two toilet and bath. The villa is perfect for family and big groups. You may opt to cook or reheat your own food, or you can order in advance at the resort's very own restaurant. Just a few steps away from the rooms is a wide expanse of shoreline where you can swim or just bask in the sun. It's a bit rocky that central Dahican Beach, but captivating nonetheless. If you are game to rough it out, you may camp at the Menzi Beach Park and Campsite for only Php 150 (tent not included; you may bring your own or rent). As a sweet bonus, there is a clean common restroom that campers and day trippers can use during their stay. The entire compound is clean and well-maintained, no trash anywhere, no loud music. Another famous camp site is the Amihan sa Dahican, headquarters of the Amihan Team in Dahican Beach. There are no rooms nor cottages here, just tents where you can rest for the night. Besides sleeping the night over, you will have the chance to mingle with the team and know how they live in between training and studies. The vibe here is so homey. It is as if you just went home to your province, with your aunt and uncle around, and your cousins welcoming you warmly. Nestled just beside Pacific Breeze is this newly built beach house that is also perfect for families and big groups. It is beachfront and has two (2) rooms that can accommodate up to three (3) people and a master suite that comes with a fully-functional kitchen and dining room. Besides Dahican Beach, you may also opt to stay at one of the resorts in Brgy. Bobon, where the newest of which is the Blue Bless Beach Resort. The resort features air-conditioned rooms with LED cable television, mini ref, toilet and bath, and veranda. For day trips and events, there are cozy floating cottages which can accommodate big groups. Oh, and by the way, here, you are free to party!